Fort Leavenworth is located in Leavenworth, Kansas and is the site of the US Disciplinary Barracks and the Midwest Joint Regional Correctional Facility, both part of the Military Corrections Complex. 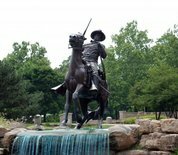 Fort Leavenworth is responsible for the US Army Combined Arms Center mission to provide leadership development, collective training and Army doctrine and battle command through the US Army Command and General Staff College and the Foreign Military Studies Office. The base is also home to one of the last Army Flying Clubs in the United States. The Fort Leavenworth Army Flying Club at Sherman Army Airfield provides active duty and retired soldiers the opportunity to earn their pilots license. This Fort Leavenworth directory features the critical info you’ll need to navigate through the many facilities and recreational opportunities available on base.